Muss man gehört haben! Sollte die Festivalbühnen Europas in Schutt und Asche legen! Während die Sängerin sich auf klassische Afrobeat-Soul-Gesangslinien versteht, begleitet sie die Band mit einer Mischung aus Hardrock, Crossover, Psych und Groove-Power. Lässt sich sehr schlecht einordnen, tritt aber unheimlich Arsch! Pop Metal? Keine Ahnung, wie man das nennen soll. Hört mal rein, das muss live der Wahnsinn sein! Klingt ein kleines bißchen so, als wären Skunk Anansie 'ne gute Band, oder wären von Rage Against the Machine überfallen worden, aber mit Schwerpunkt auf Tribal Drumming. Schiebt echt unglaublich, dem Beat kann man sich kaum entziehen. TIPP! First vinyl pressing is Limited to 1000 copies, 500 in 2 colour Blue/White vinyl (NHSLP022C), 500 in Black. Both LPs are gatefold sleeve and included a free CD & free download. CD package is a 4 panel digipack with lyric booklet. ASCEND is the second album by insurrectionary heavy rock trio Vodun, comes in. Ten slabs of ground-flattening, groove-inflected rock power, driven by the afro-inspired dervish drums of Zel Kaute (interpreting the spirits of Ogoun), the roaring, fierce chromium guitars of Linz Hamilton (The Marassa), and fronted by the fire-breathing howl of frontwoman Chantal Brown (Oya), delivering you the truth of generations with a drive and focus that can't be matched. ASCEND builds upon the foundations laid down by the London-based group's 2016 debut, Possession. The music of ASCEND is more sophisticated than on Possession, the canvas broader, the details more vivid and varied. Their palette now embraces a healthy does of extra percussion, saxophone, and vocal arrangements that pair Chantal's behemoth holler with harmonies, chants and howls, a full-spectrum of sound that suits their polymorphous attack. The band also incorporated another lead voice on the song 'New Doom', which was kindly provided by Chris Georgidias from the band Turbowolf. 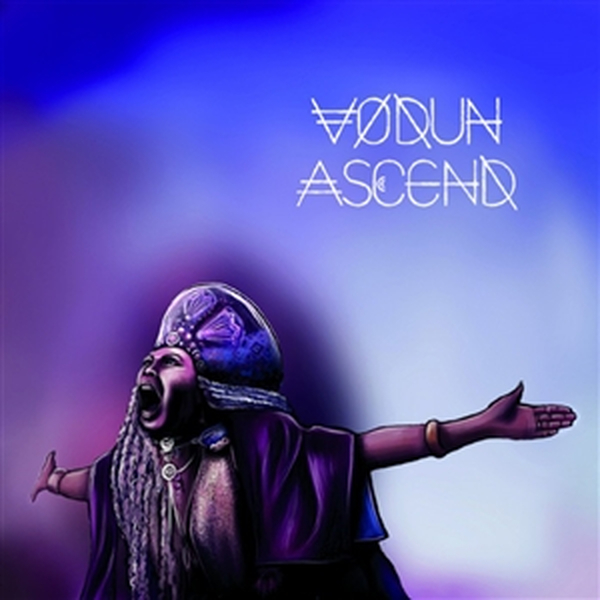 ASCEND is, unabashedly, revolution music, its ten tracks a hurricane of mystic heaviness, spiritual soul and furious positivity, its colossal riffage & rhythms allied to inspirational lyrics and powerful melodies to deliver food for the soul and fire to inflame uprisings. At heart, it's an album of musical celebration, and heavy playfulness - lyrically of resistance, and of solidarity.